Elan Paseo Vista Apartment Homes for rent in Oceanside, CA is a beautiful coastal beach town community that showcases European style villas with lush landscaping, warm sunny weather, resort style living, breathtaking views, and residents who take pride in their community. The contrast of beachside living with a traditional neighborly feel makes our community a distinctive and desirable place to live. The community has newly upgraded one and two bedroom apartment homes and one and two bedroom penthouses with amazing views that include satin nickel ceiling fans, mirrored closet doors, patios or balconies, fully equipped kitchens, walk-in closets, private enclosed garages, extra storage, mirror closet doors, and washers/dryers in select units. The community also boasts a sparkling swimming pool and relaxing spa, fitness center, on-site laundry facility and friendly on-site Staff with full-time emergency Maintenance to meet all your maintenance needs. Elan Paseo Vista welcomes cats and dogs; please see our pet policy as some restrictions may apply. 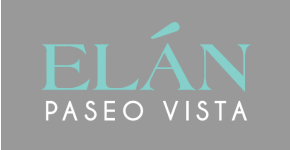 You'll find the lifestyle you deserve at Elan Paseo Vista. We are conveniently located west of Interstate 5 and close to Highway 76 and 78. Enjoy major retail shopping and dining at the Westfield Plaza Mall or visit Southern California's famous attractions including LEGOLAND California, SeaWorld, Disneyland, and the world-famous San Diego Zoo. Come and experience the casual coastal spirit of our community.